Since becoming the proud owner of Ry9 – Corriemhor – I have been keen to use her for some coastal cruising on the West Coast of Scotland. The boat is kept on a mooring in Loch Linnhe between Fort William & Oban, (lovely place, friendly people, more at Linnhe Marina ) so one of the obvious trips is to circumnavigate the Island of Mull. 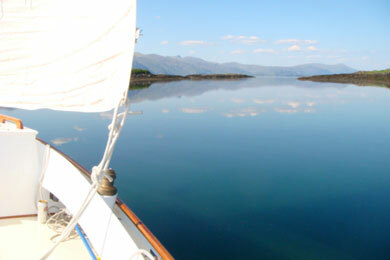 This involves a sail of some 110nm, and includes some sheltered water in Loch Linnhe and the Sound of Mull, and some more exposed waters on the West and South sides of the Island. Having started this trip last year & found unsuitable weather I was keen to try again in 2012. I met up with Toby, an old school friend, on Friday evening, & we sailed a few miles across the bay & moored in a charming shallow inlet next to Port Ramsey on the North Coast of the island of Lismore. The forecast, so often wrong in this part of the world, predicted a gentle breeze but instead we endured a bouncy F6 overnight. Packing away the cockpit tent wet with spray was not an auspicious start! By the time we set sail on Saturday morning the wind had reduced to F4-5 from the North East, so we had a comfortable run South West towards Mull. We turned North West up the Sound of Mull heading towards Tobermory and, as so often happens here, the wind followed us around so we turned through 90 degrees but continued to run in a now very pleasant sunny F2-3. Were we going to be lucky with the weather this time? 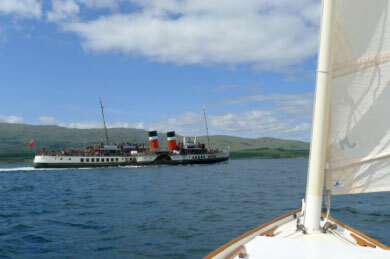 As we cruised North we enjoyed the spectacle of being overtaken by the Waverley, apparently the ‘last seagoing paddle steamer in the world’, resplendent in new paint and gong at a fantastic speed (I am guessing 15 knots) with no wake whatsoever. We arrived in Tobermory about 12.30, having sailed 30 miles in 4.5 hours. We had enjoyed a bit of help from the tide, but it was not bad for a little boat. The weather was so good we bought a few essential provisions (bacon, beer & washing up brush) & headed off at about 1400 for the West side of the Island. There are a limited number of anchorages on the West of Mull and I was keen to investigate Ulva, an island midway down the West side of the island with interesting anchorages which the pilot described as being suitable for ‘shoal draft yachts’ – which must be us! We sailed around the North of Mull &, becalmed for a while, enjoyed the views of the Cuillin hills beyond Ardnamurchan peninsula, in the clear afternoon sunlight. Once away from the North of Mull we picked up a useful F2 NE wind which gave us a comfortable broad reach/run down the West side of the island. We moored in the Sound of Ulva at about 8pm after sailing a total of about 50 miles in 10 hours. Remarkably we had run before the wind going SW, NW, & S. We had been fortunate ! 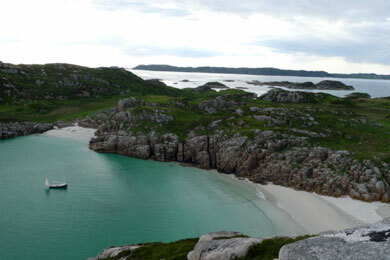 The Sound of Ulva is sheltered and shallow, everything you need when you are in a shoal draft yacht. In the morning we found ourselves aground, but a little less centerboard allowed us to get away & let the tide take us South through the Sound where we started sailing West in a SE F1-2 along the South coast of Ulva. 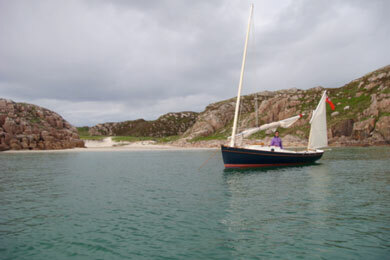 After about 5 miles we made a short stop in Cragaig Bay – a charming place of islets and shallow channels entirely unsuitable for a large cruising yacht but ideal for us. Following a relaxing stop we picked our way out between the rocks and were surprised to find that we had to beat into a gentle F1-2 towards Iona. After a walk ashore we thought we could see an even prettier anchorage and so motored half a mile East to the Sound of Erraid and dropped anchor on a sandy bottom in 3m of water. I am not sure it was prettier but it was equally pretty. On the right day I think each of these anchorages featuring pink granite, white sandy beaches and multiple islets are as beautiful as any in the world. The third day dawned bright and sunny, but with no wind. However, after a late start and some very slow beating against the tide we were delighted to find a F2-3 filling in from the SW which made our final leg a relaxing run! We sailed just over 40 miles averaging 4-5 knots to arrive back at the anchorage at about 7pm. It had all gone rather well. We’d averaged just over 4 knots in the predominantly light winds and the main passages had all been runs which gave more time to take in both the views and an occasional beer. And finally, how did the boat do? Well she gave us some wonderful sailing, was fast enough to make reasonable passage times & really looked the part anchored in the pretty deserted bays. We also really enjoyed her shoal draft feature – nosing into shallow sandy bays & navigating by centreboard (nick-named the echo sounder by the end of the trip as it gives an exact depth reading at 1.5m !). Our only criticism’s were: Firstly you really are very sensitive to the weather, both sailing & stopped. At anchor the cockpit tent is great, but its not cosy in a F6. As a result, and certainly in Scotland, you need either to be very adventurous or to pay greater attention to the weather than you would in a larger boat. Secondly, as ships facilities consist of simply ‘bucket & chuck it’ you can only share the experience with a really good friend ! Next year it would be fun to sail down to Northern Ireland or explore up North of the Ardnamurchan peninsula. Wherever we go my passage planning will continue to aim for a run before the wind in all directions.